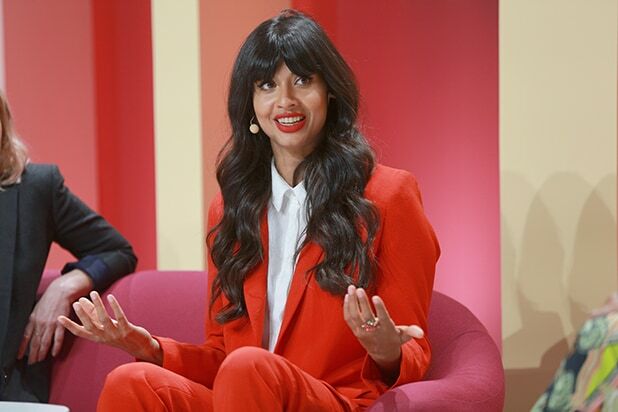 “The Good Place” star Jameela Jamil has been tapped to host the new TBS game show “The Misery Index,” the network said Thursday. She will join “Impractical Jokers” stars and “Misery Index” panelists Brian “Q” Quinn, James “Murr” Murray, Joe Gatto and Sal Vulcano on the show, which is inspired by the card game “Sh*t Happens” and draws on the comedians’ expertise in humiliation to help contestants evaluate life’s misfortunes. The show will feature two teams, each consisting of one contestant and two panelists, which will compete against each other by attempting to rate hilarious and miserable real-life events on a scale of 1-100 based on the “Misery Index,” a ranking system created by a team of therapists. For example, is getting a third degree burn worse than seeing your father naked? Is it worse than dropping your phone in the toilet? “The Misery Index” was developed by comedy writer Andy Breckman (“Monk”), along with Ben & Dan Newmark of Grandma’s House Entertainment. The series is executive produced by Breckman, the Newmarks, Adam Bold of Grandma’s House Entertainment, Howard Klein of 3 Arts Entertainment, Vin Rubino and Rob Anderson.